Every so often a newspaper will do an hilarious piece purporting to inform grown folk on how the kids live. They tend to read as if the author was a Victorian Englishman who just got plunked down into North Philly and thought he'd write a letter about what he saw to his Victorian friends back home. These things have become such an obligatory subject of mockery that I even saw them being made fun of on Law and Order the other day. My favorite used to be the Rolling Stone piece about Duke post lax-scandal, when some wiseass told the writer that we had a thing called the Duke Fifteen, the elite fifteen percent of lax players, frat stars and sorority girls, and the writer actually believed him and structured her whole article around the non-existent Fifteen. But today the Times came out with a doozy. 'The New Math On Campus: On College Campuses, a Shortage of Men.' If the editors have any sense, they'll fire the author. The piece begins with a tale of a girls' night out. The girls are at a "gritty basement bar." They sing along to Taylor Swift, drink beer, and "trade jokes." But wait, there's something missing! No guys. Jayne Dallas, a senior studying advertising who was seated across the table, grumbled that the population of male undergraduates was even smaller when you looked at it as a dating pool. “Out of that 40 percent, there are maybe 20 percent that we would consider, and out of those 20, 10 have girlfriends, so all the girls are fighting over that other 10 percent,” she said. Thanks to simple laws of supply and demand, it is often the women who must assert themselves romantically or be left alone on Valentine’s Day, staring down a George Clooney movie over a half-empty pizza box. “I was talking to a friend at a bar, and this girl just came up out of nowhere, grabbed him by the wrist, spun him around and took him out to the dance floor and started grinding,” said Kelly Lynch, a junior at North Carolina, recalling a recent experience. “If a guy is not getting what he wants, he can quickly and abruptly go to the next one, because there are so many of us,” said Katie Deray, a senior at the University of Georgia, who said that it is common to see six provocatively clad women hovering around one or two guys at a party or a bar. Since that is not her style, Ms. Deray said, she has still not had a long-term relationship in college. At colleges in big cities, women have more options... 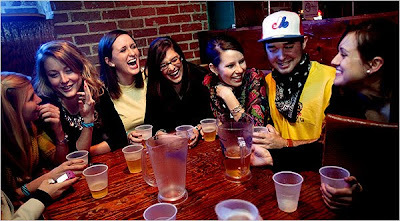 But in a classic college town, the social life is usually limited to fraternity parties, local bars or coffeehouses. The women are even more enchanting and beautiful. Someone sounds like they just stepped out of an unholy hybrid of Gone With The Wind and Superbad. In pieces like this you really have to wonder whether the kids being interviewed are putting on the writer. You also have to wonder how someone who writes for the Times could be such a dope. My guess is that they put their dimmest bulbs on pieces like this and that that explains why they're always so ridiculous. But maybe the generational disconnect is just that great. i didn't read this, but it goes without saying that this is not true. at all. it's hard to meet people, sure, but i'm not a student (yet? we'll see) and i've been here five months. also, there are guys everywhere. that i'm not "unc cute" is neither here nor there to me. Shades of 'I am Charlotte Simmons'- except it's more like 'We are sorority skanks' - the American undergrad student body writ large (mild sarcasm). NYT be slackin. Did you read the Dworkin article I linked in the Citizens United post?